PDF2EXE is an application which will assist you in converting an Adobe PDF document into a Windows executable application. Its main function is to allow anybody to view a PDF document without having the Adobe Reader installed. While converting from PDF to EXE, the look and feel of the original PDF document will be retained. With PDF2EXE, you're able to share PDF files with customers, clients, colleagues and friends without having to worry about having an applicable PDF reader installed. PDF2EXE 5.0 is a shareware program and can be used as a demo to try the software until the free trial period has ended. A full version of the program is available after the trial period ends. 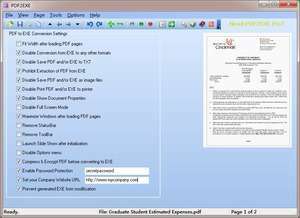 For security reasons, you should also check out the PDF2EXE download at LO4D.com which includes virus and malware tests. Additional screenshots of this application download may be available, too. 4.5 out of 5 based on 18 ratings. PDF2EXE download been highly rated by our users.